For once I'm not talking about the contents of school maths but the name and its associations. The question I'm asking is if our core technical subject wasn't termed "maths" but "nicebrand" would things go better in and out of education? Sadly, I've started to conclude the answer is yes. I now suspect that using the brand of maths is damaging core technical education, its reform, and efforts to equip society for the AI age. Believe me, this is not the conclusion I want. I've spent years of my life somehow connected with the word "maths". But much as I might not like my conclusion, I want the essence of subject maths to succeed; so I don't want the name to kill the subject—a much worse outcome. Earlier this week I was part of a high-level discussion about maths and computer science education, how we could improve their reach and effectiveness. Rather quickly the question of evidence came up, and its role in driving innovation. It's taken me a few days to realise that there were actually two very different "importance of evidence" conversations--one with which I completely concur, and one with which I vehemently disagree. In the end, what I believe this exposes is a failure of many in charge of education to understand how major innovation usually happens--whether innovation in science, technology, business or education--and how "evidence" can drive effective innovation rather than stifle it. In an age of massive real-world change, the correct and rapid reflection of this in education is crucial to future curricula, their effective deployment, and achieving optimisation for the right educational outcomes. I was very excited at our CBM summit this morning with Eben Upton to announce that Mathematica will be bundled on the Raspberry Pi computer for free, and so will the new Wolfram Language--also announced today. Fixing maths education is becoming ever more central to individual life-chances and our societal needs. So I am very pleased that we're able to collaborate with UNICEF on our 3rd CBM summit, holding it at their headquarters in New York City on November 21-22. Should long-division be the pinnacle of primary maths education? Many people asked me to comment on the UK government's draft primary curriculum in maths, and the Department of Education's response letter. Rather than compare computerbasedmath.org with the new curriculum, I'll instead make a few initial observations for those who've followed its ideas. When governments talk maths, they seem intent on convolving hand-calculating with rigour, rigour with understanding, calculating with numeracy, maths with calculating, rote-procedure learning with the vital conceptual and intellectual requirements of today's real-world maths. I read the response letter first. It fitted this mould rather too well. Then I scanned the curriculum itself. It seemed much better. I agree with many problem-solving aspirations and indeed many of the skills cited. I like its not-too-prescriptive approach, as I understand it, giving leeway for lots of different ways to achieve the teaching outcomes including (though this is not specifically cited) basing it on technology. Yes, I'd like this to be much more radical and programming to be included as a core skill, but I understand the difficulty of hard-coding it at this stage. I also understand why there's little reference to technology on the basis that its use isn't an outcome but a highly appropriate (I'd argue essential) tool to reach the outcome--outcomes which I think could have been bolder if computers were the default assumption for calculating. Where my support starts to diverge is with procedures for multiplying fractions (when did you last use this formally eg. 3/16 x 7/8?) and there's a gaping chasm by the time we get to long-division (ever need to use that?). Not only are these examples mechanics-led outcomes, not problem-centric (in the end it's problems that maths is there to solve not its own mechanics), but the mechanics in question is in practice obsolete ie. it's not in use in the real world nor do I believe it empowers understanding that is. This saps student's time, energy and motivation. But I'm concerned about a far more serious problem: the lowly government portrayal of maths. Should placing long-division or learning your times tables really be portrayed as the pinnacle of achievement in maths at primary school? Worse still, why imply that those tedious procedures are what maths is primarily about? This is about the worst maths marketing you can do to prospective students--and in the long term to parents. Perhaps it's a good short term vote-winner for some, like brands that consistently do special offers improving sales short-term, but it's not a good long-term strategy for building a quality image of maths in our society or one that's aspirational. It's using long-division as a badge of honour of what the government call rigour when in fact it's a prime example of mindless manual processing. And more than ever, it presents a broadening chasm between government's view of maths and the real-world subject. The nub of real maths isn't rote-learning procedures nor does it depend upon them. 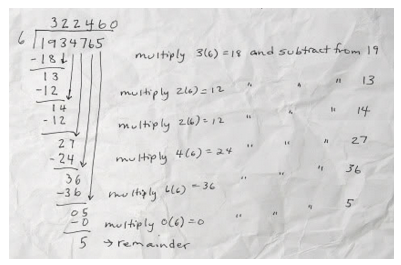 It's not calculating, but the highly challenging mathematising of ever more complex situations for a computer to calculate, de-mathematising the results and validating their worth. It's creative, applied, powers some of the most successful ideas and developments of recent centuries and can even be fun and engaging! A useful analogy is with survival skills. In the past your life would depend on rubbing sticks together to make a fire. Now those aren't likely to be life or death. Instead basic survival is how to cross the road or handle money. What are today's maths survival skills? What's at the pinnacle of today's maths? Instead of rote learning long-division procedures, let's get students applying the power of calculus, picking holes in government statistics, designing a traffic system or cracking secret codes (so topical this month with Alan Turing's anniversary and his computer-based code breaking). All are possible, all train both creativity, conceptual understanding and have practical results. But they need computers to do most of the calculating--just like we do in the real world. Examples from Wolfram Demonstrations site. I hope these sorts of examples will all be encouraged under this new curriculum, and crucially that the assessments will highly value the skills they require, utilising computers so problems can be harder, more realistic and far more engaging. One country will take this computer-based approach first and leapfrog others' technical education. This change will happen. The question is when not if. I worry that the UK won't be in the leading edge of this, but in so many ways it still could be. Meanwhile, I won't be much help with my daughter's long-division homework. I've actually never learnt how to do long-division; I don't think it's disadvantaged me one iota. P.S. Paradoxically, I would include times tables in a curriculum: they're still useful. Surrounded as I am by computers, I still find mentally hand-estimating helps me make quick judgements on information and I often do approximate multiplications to achieve that. Of course I could get my computer to do this---but for the moment, it's that bit slower. I do not think times tables give one valuable inherent understanding; but they are useful. Long-division doesn't and it isn't. It seems an age since I gave this in July, but "Stop teaching calculating, start teaching math" is up. Interested in the comments that come back. P.S. Why is it "maths" in British and "math" in American? I naturally say the former--being British--but rightly or wrongly endeavour to use the latter for international groups. We've started computerbasedmath.org ---a home for the project to make maths (and STEM) education get computer-based. It's just the beginning; we'll add more soon. I'm looking forward to collecting like-minded people to drive this forward. Do leave your name there! "Is it cheating to use Wolfram|Alpha for math homework?" That's the (complex) question I began to answer in my 18 minute TEDx talk at the EU parliament. A video of the talk--entitled "I calculate, therefore I am"--is posted on YouTube.